The events connected with the Passion, Death and Resurrection of Christ have been enacted and dramatised all over the Christian world. It is said that events in Easter gave birth to Christian drama. 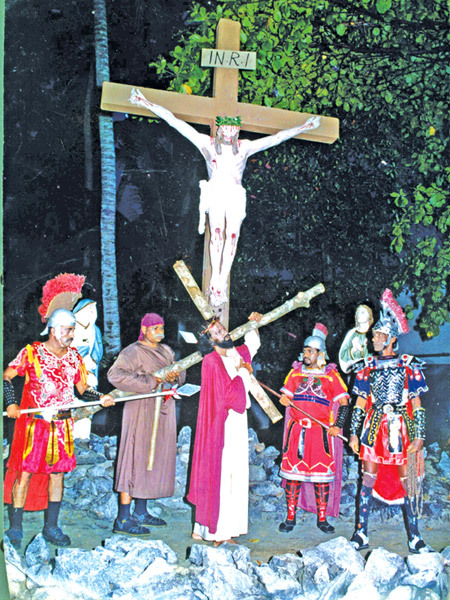 In Sri Lanka too we have a popular form of drama on the Death and Resurrection of Christ known in Sinhala as Pasku. Good Friday is the day on which Christians commemorate the death of Jesus on the Cross. With Jesus' death on the cross, the cross gradually became the symbol of the Christian faith. How and why did the cross become synonymous with Christianity? During the time of Jesus, about 2,000 years ago, under the Roman imperial government, death on a cross was the way in which Romans executed thieves, robbers, rebels and other such people who became a threat to the peaceful way of life under their rule. Then why did Jesus have to undergo this sort of death?